Ohm’s law is a fundamental law of Electrical and Electronic Engineering which relates the quantities of Voltage, Current, and Resistance together. 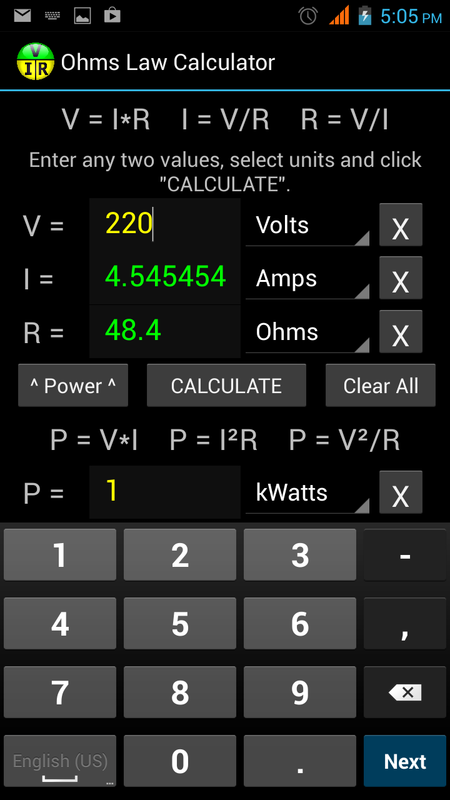 This small App allows the user to easily do Ohm’s law calculations to calculate Voltage, Current and Resistance. It also (optionally) calculates the associated Power dissipation value. The user enters any two known values (V, I, R or P) and clicks the CALCULATE button to work out the missing values. The user selects the proper units for the values entered and the calculator presents the proper units for the results. Check the Downloads page if you want to try it out. Or the Google Play store.